As Media publicized, the Revised Allowances will not make Central Govt Employees happy and its not a Bonanza too. Most of the Allowances , especially the fully DA indexed Allowances are not given any hike. The Govt servants will be getting more or less same amount from this Fully DA indexed Allowances after the revision in Seventh CPC. It is observed that there is a marginal decrease in 7th CPC Transport Allowance for the Level 3 and above. Whereas for Level 1 and 2 , It is a different story. They will be getting less amount of Money after switching over to 7th CPC. The Employees those who were in 1800 GP and 1900 GP and pay in the pay band equivalent to Rs.7440 and above will be losing considerable amount on switching over to 7th CPC. For Example, we calculate amount of TA in both Sixth CPC and 7th CPC for a government servant who fall under this category. It is surely not a bonanza for govt servants those who fall under the Category of GP 1800 and GP 1900 with pay in the pay band equivalent to Rs.7440 and above. They will be losing Rs .2372 in 7th CPC because of this Pay Revision. It is quite unreasonable. The very purpose of the Pay Revision is to give Hike not reduction. The Federation need to take this issue up to the appropriate Level to settle this favorably. (i) Rate of Children Education Allowance (CEA) has been increased from ₹1500 per month / child (max. 2) to ₹2250 per month / child (max.2). Hostel Subsidy will also go up from ₹4500 per month to ₹6750 per month. (ii) Existing rates of Special Allowance for Child Care for Women with Disabilities has been doubled from ₹1500 per month to ₹3000 per month. (iii) Higher Qualification Incentive for Civilians has been increased from ₹2000 – ₹10000 (Grant) to ₹10000 – ₹30000 (Grant). 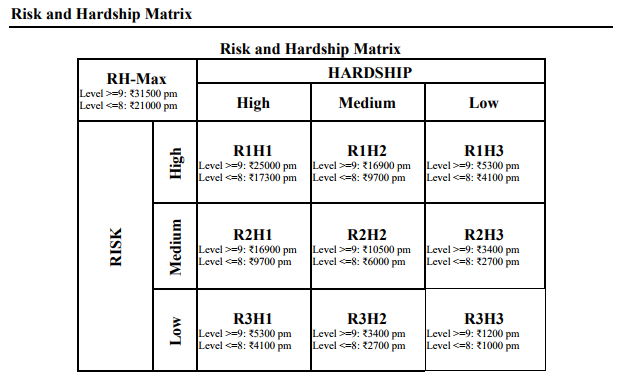 Risk and Hardship Allowance: Allowances relating to Risk and Hardship will be governed by the newly proposed nine-cell Risk and Hardship Matrix, with one extra cell at the top, viz., RH-Max to include Siachen Allowance. This would be the ceiling for risk/hardship allowances and there would be no individual RHA with an amount higher than this allowance. The construct of the Risk and Hardship Matrix, proposed above, is a new paradigm intended to rationalize the myriad allowances, their categories and sub-categories that exist today. It would make the administration of these allowances simple and provide a framework for the government for future inclusion of any new allowance, which can be placed in the appropriate cell depending upon the severity of the risk and hardship involved. A new paradigm has been evolved to administer the allowances linked to risk and hardship. The myriad allowances, their categories and sub–categories pertaining to civilians employees, CAPF and defence personnel have been fitted into a table called the Risk and Hardship Matrix (R&H Matrix). The Matrix has nine cells denoting varying degrees of risk and hardship with one extra cell at the top named as RH – Max to include Siachen Allowance. Multiple rates applicable to individual allowances will be replaced by two slab rates for every cell of the R&H Matrix. Siachen Allowance : 7th CPC had placed Siachen Allowance in the RH-Max cell of the R&H Matrix with two slabs of ₹21,000 and ₹31,500. Recognizing the extreme nature of risk and hardship faced by officers / PBORs on continuous basis in Siachen, the Government has decided to further enhance the rates of Siachen Allowance which will now go up from the existing rate from ₹14,000 to ₹30,000 per month for Jawans & JCOs (Level 8 and below) and from ₹21,000 to ₹42,500 per month for Officers (Level 9 and above). With this enhancement, Siachen Allowance will become more than twice the existing rates. It will benefit all the soldiers and officers of Indian Army who are posted in Siachen. Tough Location Allowance : Some allowances based on geographical location such as Special Compensatory (Remote Locality) Allowance (SCRLA), Sunderban Allowance & Tribal Area Allowance have been subsumed in Tough Location Allowance. The areas under TLA have been classified into three categories and the rates will be governed as per different cells of R&H Matrix and will be in the range of ₹1000 – ₹5300 per month. The 7th CPC had recommended that TLA will not be admissible with Special Duty Allowance (SDA) payable in North-East, Ladakh and the Islands. Government has decided that employees will be given the option to avail of the benefit of SCRLA at pre-revised rates along with SDA at revised rates. Rates of High Altitude Allowance granted to Defence Forces and CAPF personnel will be governed by the R&H Matrix. The rates will go up from ₹810 – ₹16800 per month to ₹2700 – ₹25000 per month. Field Area Allowances are granted to Indian Army, Air Force & CAPF personnel. The rates of Field Area Allowances (Modified Field, Field & Highly Active) will be governed by the R&H Matrix. The rates will go up from ₹1200 – ₹12600 per month to ₹6000 – ₹16900 per month. Classification of field areas for this allowance will be done by Ministry of Defence for Defence personnel and by Ministry of Home Affairs for CAPFs. The rates of Counter Insurgency Ops (CI Ops) Allowance, granted to Defence and CAPFs while deployed in counter – insurgency operations will be governed by the R&H Matrix. The rates will go up from ₹3000 – ₹11700 per month to ₹6000 – ₹16900 per month. Rates of MARCOS and Chariot Allowance granted to marine commandos of Indian Navy will be governed by the R&H Matrix. The rates will go up from ₹10500 – ₹15750 per month to ₹17300 – ₹25000 per month. Rates of Sea Going Allowance granted to personnel of Indian Navy will be governed by the R&H Matrix. The twelve hour conditionality for determining the eligibility of Sea Going Allowance has been reduced to four hours. The rates will go up from ₹3000 – ₹7800 per month to ₹6000 – ₹10500 per month. Rates of Commando Battalion for Resolute Action (COBRA) Allowance granted to CRPF personnel deployed in Naxal hit areas will be governed by the R&H Matrix. The rates will go up from ₹8400 – ₹16800 per month to ₹17300 – ₹25000 per month. Rates of Flying Allowance granted to flying branch and technical officers of Defence Forces will be governed by the R&H Matrix. The rates will go up from ₹10500 – ₹15750 per month to ₹17300 – ₹25000 per month. It has been extended mutatis mutandis to BSF Air Wing also. Rates of Test Pilot and Flight Test Engineer Allowance will be governed by the R&H Matrix. The rates will go up from ₹1500 / ₹3000 per month to ₹4100 / ₹5300 per month. The 7th CPC had placed Antarctica Allowance, paid to the Scientists and other members undertaking the expedition to Antarctica under the Indian Antarctic programme, in the RH-Max Cell of the R&H Matrix. The rates of the RH-Max Cell recommended by the 7th CPC were less than the existing rates of Antarctica Allowance which is currently paid on per day basis. Considering the specific nature of these expeditions and to provide appropriate increase in rates, Government has decided to keep Antarctica Allowance out of the R&H Matrix and the allowance will continue to be paid on per day basis as per existing practice. The Rates of Antarctica Allowance will go up from ₹1125 per day (Summers) and ₹1688 per day (Winters) to ₹1500 per day (Summers) and ₹2000 per day (Winters). The 7th CPC had adopted a three-pronged approach in examining a total of 197 allowances which involved an assessment of the need for continuation of each allowance, appropriateness of the set of people covered by the allowance and rationalisation which involved clubbing of allowances with similar objectives. Based on the examination on these lines, the 7th CPC recommended that 53 allowances be abolished and 37 be subsumed in an existing or a newly proposed allowance. For most of the allowances that were retained, the 7th CPC recommended a raise commensurate with inflation as reflected in the rates of Dearness Allowance (DA). Accordingly, fully DA-indexed allowances such as Transport Allowance were not given any raise. Allowances not indexed to DA were raised by a factor of 2.25 and the partially indexed ones by a factor of 1.5. The quantum of allowances paid as a percentage of pay was rationalised by a factor of 0.8. The Union Cabinet chaired by the Prime Minister Shri Narendra Modi approved the recommendations of the 7th CPC on allowances with some modifications. The revised rates of the allowances shall come into effect from 1st July, 2017 and shall affect more than 48 lakh central government employees. While approving the recommendations of the 7th CPC on 29th June, 2016, the Cabinet had decided to set up the Committee on Allowances (CoA) in view of substantial changes in the existing provisions and a number of representations received. The modifications are based on suggestions made by the CoA in its Report submitted to Finance Minister on 27th April, 2017 and the Empowered Committee of Secretaries set up to screen the recommendations of 7th CPC. 7th CPC recommendations on Allowances : The 7th CPC had adopted a three-pronged approach in examining a total of 197 allowances which involved an assessment of the need for continuation of each allowance, appropriateness of the set of people covered by the allowance and rationalisation which involved clubbing of allowances with similar objectives. Based on the examination on these lines, the 7th CPC recommended that 53 allowances be abolished and 37 be subsumed in an existing or a newly proposed allowance. Modifications approved by the Cabinet : The modifications approved today were finalised by the E-CoS based on the recommendations of the CoA. The CoA had undertaken extensive stakeholder consultations before finalising its recommendations. It had interacted with Joint Consultative Machinery (Staff side) and representatives from various staff associations. Most of the modifications are on account of continuing requirement of some of the existing arrangements, administrative exigencies and to further the rationalization of the allowances structure. Financial Implications : The modifications approved by the Government in the recommendations of the 7th CPC on allowances will lead to a modest increase of ₹1448.23 crore per annum over the projections made by the 7th CPC. The 7th CPC, in its Report, had projected the additional financial implication on allowances at ₹29,300 crore per annum. The combined additional financial implication on account of the 7th CPC recommendations along with the modifications approved by the Cabinet is estimated at ₹30748.23 crore per annum. 1. Number of allowances recommended to be abolished and subsumed: Government has decided not to abolish 12 of the 53 allowances which were recommended to be abolished by the 7th CPC. The decision to retain these allowances has been taken keeping in view the specific functional requirements of Railways, Posts and Scientific Departments such as Space and Atomic Energy. It has also been decided that 3 of the 37 allowances recommended to be subsumed by the 7th CPC will continue as separate identities. This has been done on account of the unique nature of these allowances. The rates of these allowances have also been enhanced as per the formula adopted by the 7th CPC. This will benefit over one lakh employees belonging to specific categories in Railways, Posts, Defence and Scientific Departments. HRA is currently paid @ 30% for X (population of 50 lakh & above), 20% for Y (5 to 50 lakh) and 10% for Z (below 5 lakh) category of cities. 7th CPC has recommended reduction in the existing rates to 24% for X, 16% for Y and 8% for Z category of cities. As the HRA at the reduced rates may not be sufficient for employees falling in lower pay bracket, it has been decided that HRA shall not be less than ₹5400, ₹3600 and ₹1800 for X, Y and Z category of cities respectively. This floor rate has been calculated @ 30%, 20% and 10% of the minimum pay of ₹18000. This will benefit more than 7.5 lakh employees belonging to Levels 1 to 3. 7th CPC had also recommended that HRA rates will be revised upwards in two phases to 27%, 18% and 9% when DA crosses 50% and to 30%, 20% and 10% when DA crosses 100%. Keeping in view the current inflation trends, the Government has decided that these rates will be revised upwards when DA crosses 25% and 50% respectively. This will benefit all employees who do not reside in government accommodation and get HRA. 7th CPC had placed Siachen Allowance in the RH-Max cell of the R&H Matrix with two slabs of ₹21,000 and ₹31,500. Recognizing the extreme nature of risk and hardship faced by officers / PBORs on continuous basis in Siachen, the Government has decided to further enhance the rates of Siachen Allowance which will now go up from the existing rate from ₹14,000 to ₹30,000 per month for Jawans & JCOs (Level 8 and below) and from ₹21,000 to ₹42,500 per month for Officers (Level 9 and above). With this enhancement, Siachen Allowance will become more than twice the existing rates. It will benefit all the soldiers and officers of Indian Army who are posted in Siachen. Some allowances based on geographical location such as Special Compensatory (Remote Locality) Allowance (SCRLA), Sunderban Allowance & Tribal Area Allowance have been subsumed in Tough Location Allowance. The areas under TLA have been classified into three categories and the rates will be governed as per different cells of R&H Matrix and will be in the range of ₹1000 – ₹5300 per month. The 7th CPC had recommended that TLA will not be admissible with Special Duty Allowance (SDA) payable in North-East, Ladakh and the Islands. Government has decided that employees will be given the option to avail of the benefit of SCRLA at pre-revised rates along with SDA at revised rates. i. The 7th CPC has recommended abolition of Ration Money Allowance (RMA) and free ration to Defence officers posted in peace areas. It has been decided that Ration Money Allowance will continue to be paid to them and directly credited to their account. It will benefit 43000 Defence officers. ii. Technical Allowance (Tier – I & II) are paid to Defence officers belonging to technical branches @₹3000 per month and ₹4500 per month. 7th CPC has recommended that Technical Allowance (Tier – II) be merged with Higher Qualification Incentive for Defence personnel. In view of the specific requirements of Defence Forces for the Defence personnel to keep pace with changing Defence requirements and technologies, the Government has decided not to discontinue Technical Allowance. The list of courses for these allowances will be reviewed to remain in sync with the latest technical advancements in Defence. iii. The facility of one additional free railway warrant (Leave Travel Concession) presently granted to personnel of Defence Forces serving in field/high altitude/CI Ops shall also be extended to all personnels of CAPFs and the Indian Coast Guard. iv. Rates of High Altitude Allowance granted to Defence Forces and CAPF personnel will be governed by the R&H Matrix. The rates will go up from ₹810 – ₹16800 per month to ₹2700 – ₹25000 per month. v. Field Area Allowances are granted to Indian Army, Air Force & CAPF personnel. The rates of Field Area Allowances (Modified Field, Field & Highly Active) will be governed by the R&H Matrix. The rates will go up from ₹1200 – ₹12600 per month to ₹6000 – ₹16900 per month. Classification of field areas for this allowance will be done by Ministry of Defence for Defence personnel and by Ministry of Home Affairs for CAPFs. vi. 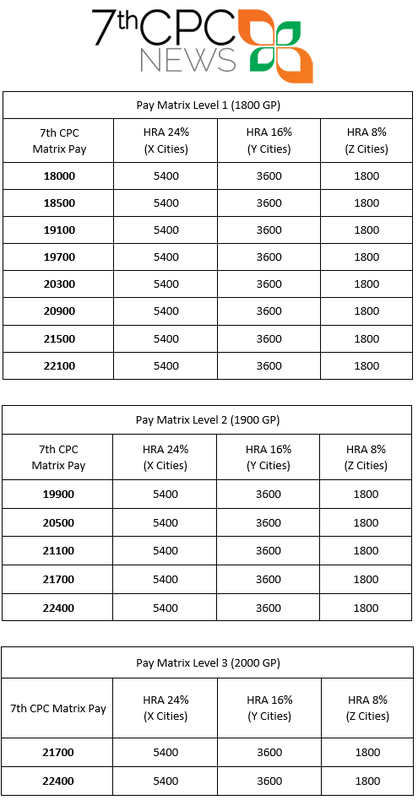 The rates of Counter Insurgency Ops (CI Ops) Allowance, granted to Defence and CAPFs while deployed in counter – insurgency operations will be governed by the R&H Matrix. The rates will go up from ₹3000 – ₹11700 per month to ₹6000 – ₹16900 per month. vii. Rates of MARCOS and Chariot Allowance granted to marine commandos of Indian Navy will be governed by the R&H Matrix. The rates will go up from ₹10500 – ₹15750 per month to ₹17300 – ₹25000 per month. viii. Rates of Sea Going Allowance granted to personnel of Indian Navy will be governed by the R&H Matrix. The twelve hour conditionality for determining the eligibility of Sea Going Allowance has been reduced to four hours. The rates will go up from ₹3000 – ₹7800 per month to ₹6000 – ₹10500 per month. ix. Rates of Commando Battalion for Resolute Action (COBRA) Allowance granted to CRPF personnel deployed in Naxal hit areas will be governed by the R&H Matrix. The rates will go up from ₹8400 – ₹16800 per month to ₹17300 – ₹25000 per month. x. Rates of Flying Allowance granted to flying branch and technical officers of Defence Forces will be governed by the R&H Matrix. The rates will go up from ₹10500 – ₹15750 per month to ₹17300 – ₹25000 per month. It has been extended mutatis mutandis to BSF Air Wing also. xi. Rates of Higher Qualification Incentive for Defence Personnel have been increased from ₹9000 – ₹30000 (Grant) to ₹10000 – ₹30000 (Grant). xii. Aeronautical Allowance, presently paid to personnel of Indian Navy, has been extended to Indian Coast Guard. The rate of this allowance has been increased from ₹300 per month to ₹450 per month. xiii. Rates of Test Pilot and Flight Test Engineer Allowance will be governed by the R&H Matrix. The rates will go up from ₹1500 / ₹3000 per month to ₹4100 / ₹5300 per month. xiv. Rates of Territorial Army Allowance have been increased from ₹175 – ₹450 per month to ₹1000 – ₹2000 per month. xv. Ceilings of Deputation (Duty) Allowance for Defence Personnel have been increased from ₹2000 – ₹4500 per month to ₹4500 – ₹9000 per month. xvi. Rates of Detachment Allowance have been increased ₹165 – ₹780 per day to ₹405 – ₹1170 per day. xvii. Rates of Para Jump Instructor Allowance have been increased from ₹2700/3600 per month to ₹6000 / 10500 per month. xviii. Special Incident / Investigation / Security Allowance has been rationalized. Rates for Special Protection Group (SPG) have been revised to 55% and 27.5% of Basic Pay for operational and non – operational duties respectively. i. Rates of Additional Allowance have been increased from ₹500 / 1000 per month to ₹1125 / 2250 per month. This has also been extended to Loco Pilot Goods and Senior Passenger Guards also @₹750 per month. ii. In view of strenuous nature of the job, new Allowance namely Special Train Controller’s Allowance @5000 per month for Train Controllers of Railways has been introduced. i. Existing rate of Nursing Allowance has been increased from ₹4800 per month to ₹7200 per month. ii. Rate of Operation Theatre Allowance has been increased from ₹360 per month to ₹540 per month. iii. Rates of Hospital Patient Care Allowance / Patient Care Allowance have been increased from ₹2070 – ₹2100 per month to ₹4100 – ₹5300 per month. 7th CPC recommendations modified to the extent that it will be granted to Ministerial staff also. Rate of Fixed Medical Allowance (FMA) for Pensioners has been increased from ₹500 per month to ₹1000 per month. This will benefit more than 5 lakh central government pensioners not availing CGHS facilities. i. The rate of Constant Attendance Allowance granted on 100% disablement has been increased from ₹4500 per month to ₹6750 per month. i. The recommendations of 7th CPC to abolish Launch Campaign Allowance and Space Technology Allowance has not been accepted. In order to incentivize the supporting employees in Space and Atomic Energy sector, the rate of Launch Campaign and Space Technology Allowance has been increased from ₹7500 per annum to ₹11250 per annum. Professional Update Allowance for non-gazetted employees of Department of Atomic Energy will also continue to be paid at the enhanced rate of ₹11250 per annum. ii. The 7th CPC had placed Antarctica Allowance, paid to the Scientists and other members undertaking the expedition to Antarctica under the Indian Antarctic programme, in the RH-Max Cell of the R&H Matrix. The rates of the RH-Max Cell recommended by the 7th CPC were less than the existing rates of Antarctica Allowance which is currently paid on per day basis. Considering the specific nature of these expeditions and to provide appropriate increase in rates, Government has decided to keep Antarctica Allowance out of the R&H Matrix and the allowance will continue to be paid on per day basis as per existing practice. The Rates of Antarctica Allowance will go up from ₹1125 per day (Summers) and ₹1688 per day (Winters) to ₹1500 per day (Summers) and ₹2000 per day (Winters). i. The recommendations of 7th CPC to abolish Cycle Allowance, granted mainly to Postmen and trackmen in Railways, has not been accepted. Keeping in view the specific requirement of this allowance for postmen in Department of Posts and trackmen in Railways, the cycle allowance is retained and the rates have been doubled from ₹90 per month to ₹180 per month. This will benefit more than 22,200 employees. While increasing the rate of allowances affecting the central government employees, especially the Defence, CAPF and Coast Guard personnel, the staff of Railways, Postal department and nursing staff, the total number of allowances have been rationalized from 197 to 128. Thus, the Government has shown a great deal of fiscal prudence and at the same time addressed the genuine concerns of the employees and responded to some of the administrative exigencies necessitating the modifications. Press Note - The Union Cabinet chaired by the Prime Minister Shri Narendra Modi approved the recommendations of the 7th CPC on allowances with some modifications. MOST INSPIRING STRUGGLE IN THE HISTORY OF CASUAL LABOURERS. As per the decision taken by the Central Working Committee of All India Postal Casual , Partime , Contingent and Contract Workers Federation , the fast infront of Chief PMG office Chennai commenced on 27th June 2017 demanding revision of wages of Casual Labourers with effect from 01.01.2006 and 01.01.2016 as per orders issued by Postal Directorate. Along with leaders of Casual Labour Federation , leaders of NFPE Circle Co-ordinating Committee (CCC) , Confederation State Committee also joined the programme extending full support and solidarity. The programme was organised under the leadership of NFPE CCC Tamilnadu Circle. More than 1000 casual workers participated in the struggle. Chief PMG held two round discussions with Circle Secretaries of NFPE on 27th June. CPMG took a stand that Directorate orders are not implemented in any circle and challenged our leaders to produce copies of the orders issued by Divisions in other circles. Next day morning Circle leaders produced before the Assistant Director , copies of orders issued and implemented in many divisions of Kerala , Andhra and Telangana including Vijayawada Region where the CPMG was working as PMG prior to his promotion as CPMG Tamilnadu. Understanding that his arguments stands demolished by NFPE Circle Unions , the CPMG , instead showing the courage to face the NFPE leaders again in the discussion table , suddenly left Chennai (ran away !!) without intimating the leaders. It is learnt that he will not be available in Chennai for next four days. NFPE COC held an emergent meeting and decided to declare one day strike on 13th July 2017 protesting against the negative stand of the Circle administration and demanding immediate wage revision of Casual Labourers. Accordingly 14 days legal notice for the strike was served on 28th June 2017. Entire employees of Tamilnadu Circle (P3 , P4 , R3 , R4 , Admin , Postal Accounts , SBCO , GDS and Casual Labourers) will go on strike for the cause of Casual Labourers declaring -- "an injury to one is an injury to all" !!!. As strike is declared , NFPE CCC decided to call off the fast in front of CPMG office and the mass fast ended at 5 PM on 28th June with thundering slogans. The Fast was inaugurated by Com M.Durai Pandian , General Secretary , Confederation Tamilnadu state. Com: T.K.Rangarajan , MP (CPIM) and Shri R.S.Bharati , MP (DMK) addressed the programme. National leaders of Casual Labour Federation Coms: M.Krishnan (President) Y.Nagabhushanam (Working President) P.Mohan (General Secretary) D.Sivagurunathan (CHQ Treasurer) S.Balamurugan (CHQ OGS) alongwith NFPE leaders Coms: J.Ramamurthy (CHQ President P3 & CS P3 ) B.Paranthaman (President CCC NFPE) G.Kannan (Convenor CCC NFPE) Angel Sathyanathan (Chairman , Women's Committee) participated in the fast. Com A.G.Pasupathy , veteran leader of P&T Trade Union movement (86 years) participated on two days. Coms: K.Raghavendran (Ex-SG NFPE & GS AIPRPA) K.V.Sreedharan (Ex-GS P3) K.Regupathy ( Asst SG NFPE) A.Veeramani (AGS P3 CHQ) R.B.Suresh (CS AIPAEA) K.R.Ganesan (Circle President R3 ) Dhananjay (CS AIPEU -GDS) Santhoshkumar (President , AIPAEA CHQ) attended and addressed the gathering. Shri D.Theagarajan (SG FNPO) and Shri Kumar (FNPO & Chairman PJCA) Leaders of AIRF, DREU and Confederation affiliates also addressed. The inspiring struggle of the most down trodden, marginalised and poor casual labourers of Tamilnadu will be written in red letters in the history of the struggles of Postal employees. Red Salute to the NFPE / Confederation/ Casual Labour leaders and members who made it a historic struggle. NDA Government has once again betrayed the entire Central Govt Employees. The demand of the employees to restore HRA to 30, 20 & 10% is denied. Date of effect for allowances is fixed as 01-07-2017 denying 18 months arrears. The BJP lead NDA Government deliberately delayed the legitimate right of the employees. The assurance given by Cabinet Ministers regarding increase in Minimum Pay and Fitment Formula is also not honoured till date. NDA Government is the worst Government as far as employees and workers are concerned. Confederation National Secretariat calls upon entire Central Govt Employees to hold demonstrations in front of all Central Govt Offices protesting against the anti-employees, anti-workers stand of the NDA Government. Cabinet Committee has decided to implement the recommendations of 7th CPC on Transport Allowance without any change. Cabinet approval on 7th CPC House Rent Allowance (28.6.2017) : HRA is currently paid @ 30% for X (population of 50 lakh & above), 20% for Y (5 to 50 lakh) and 10% for Z (below 5 lakh) category of cities. 7th CPC has recommended reduction in the existing rates to 24% for X, 16% for Y and 8% for Z category of cities. As the HRA at the reduced rates may not be sufficient for employees falling in lower pay bracket, it has been decided that HRA shall not be less than ₹5400, ₹3600 and ₹1800 for X, Y and Z category of cities respectively. This floor rate has been calculated @ 30%, 20% and 10% of the minimum pay of ₹18000. This will benefit more than 7.5 lakh employees belonging to Levels 1 to 3. Rate of Children Education Allowance (CEA) has been increased from ₹1500 per month / child (max. 2) to ₹2250 per month / child (max.2). Hostel Subsidy will also go up from ₹4500 per month to ₹6750 per month. Existing rates of Special Allowance for Child Care for Women with Disabilities has been doubled from ₹1500 per month to ₹3000 per month. Higher Qualification Incentive for Civilians has been increased from ₹2000 – ₹10000 (Grant) to ₹10000 – ₹30000 (Grant). HRA is currently paid @ 30% for X (population of 50 lakh & above), 20% for Y (5 to 50 lakh) and 10% for Z (below 5 lakh) category of cities. 7th CPC has recommended reduction in the existing rates to 24% for X, 16% for Y and 8% for Z category of cities. It is really a Shocking News for Central government Employees that 7th CPC HRA is not increased and retained the recommendation of 7th CPC on House rent Allowances with slight modifications. The date of effect of Allowances is another shock for CG Staffs. The 7th CPC has recommended 24% , 16% and 8% for X, Y and Z cities. The Federations expressed their anguish over the Recommendation of HRA and other Allowances,Then Government Constituted a Committee to Examine the Allowances. After the Long wait, now the Government approved the same rates of House rent allowance which 7th CPC Recommended. 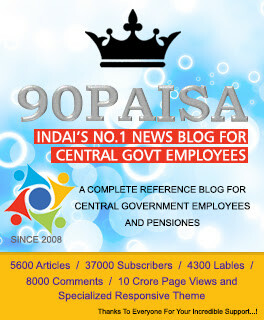 It is really a big upset for Central government Employees. If the Government decided to approve the same rates , it should have been implemented with effect from 1st July 2016 instead of 1st July 2017. After 12 months wait the Government has decided to implement the Allowances without any Hike with effect from 1st July 2017 . It is tough decision to accept by Cg Staffs. Government has decided not to abolish 12 of the 53 allowances which were recommended to be abolished by the 7th CPC. The decision to retain these allowances has been taken keeping in view the specific functional requirements of Railways, Posts and Scientific Departments such as Space and Atomic Energy. It has also been decided that 3 of the 37 allowances recommended to be subsumed by the 7th CPC will continue as separate identities. This has been done on account of the unique nature of these allowances. The rates of these allowances have also been enhanced as per the formula adopted by the 7th CPC. This will benefit over one lakh employees belonging to specific categories in Railways, Posts, Defence and Scientific Departments. The Union cabinet on Wednesday approved the recommendations of the 7th Pay Commission for higher allowances, including house rent allowance (HRA). The HRA that has been approved will be 24%, 16% and 8% of the new basic pay, depending on the type of city. “The HRA will not be less than Rs 5,400, Rs 3,600 and Rs 1,800 depending on the type of city and calculated at 30%, 20% and 10% of minimum pay Rs 18,000,” a government statement said. The HRA revision will benefit more than 7,5 lakh employees. HRA constitutes 60% of the total allowance of a government employee’s pay. The cabinet decision comes more than a year after the pay of central government employees was increased. The financial implication of revised allowances would be around Rs 30,748 crore per annum, the statement said. * Rates of Siachen allowance for soldiers increased from Rs 14,000 to Rs 30,000 per month and from Rs 21,000 to Rs 42,500 for officers per month for extreme risks and hardship. * Fixed medical allowance for pensioners increased from Rs 500 to Rs 1,000 per month. * Constant attendance allowance for those with 100% disability has been increased from Rs 4,500 to Rs 6,750 per month. * Rate of nursing allowance increased from Rs 4,800 to Rs 7,200 per month. * Operation theatre allowance increased from Rs 360 to Rs 540 per month. * Hospital patient care allowance/patient care allowance increased from Rs 2,070 to Rs 4,100 per month and Rs 2,100 to Rs 5,300 per month. Finance Minister Arun Jaitley has confirmed that the Union Cabinet approved the recommendation of Seventh Pay Commission on allowances with 34 modifications. The Union Cabinet headed by Prime Minister Shri. Narendra Modi met today and approved the 7th CPC recommendation on Allowances. The details of Modification Proposed on Allowances yet to be announced. But it is informed that It will be implemented with effect from 1st July. The combined additional Financial implication for implementation of HRA and other Allowances estimated at Rs.30748 Crores per Annum. The Percentage of HRA and other Allowances yet to be declared. The wait to get clarity on allowances like House Rent Allowance (HRA) and Dearness Allowance (DA) under the 7th Pay Commission may be over on Wednesday as the Cabinet is likely to convene a meeting and announce its decision. One crore Central Government employees and pensioners are waiting for news on their arrears and allowances like HRA and DA. The 7th Pay Commission had recommended HRA too be fixed at 24%, 16% and 8% depending on the cities employees work in. However, employees were not happy with this increase and demanded 30%, 24% and 16% HRA. The Committee on Allowances that FM Jaitley set up last year under leadership of Finance Secretary Ashok Lavasa submitted its reported earlier this year and suggested HRA to be fixed at between 25% and 27%. Although the HRA recommended by Committee on Allowances is higher than the one given by 7th Pay Commission, it is still lower than what the employees demanded. Under the 7th Pay Commission, nearly 200 allowances have been subsumed into a smaller batch. There has been considerable delay on the allowances front of the 7th Pay Commission as the Empowered Committee of Secretaries submitted its report to FM Jaitley on June 1, 2017. Sub :- Revitalisation of Army Base Workshops. This Federation has been receiving regular inputs regarding deteriorating conditions of the Army Base Workshops, non-availability of spares on time, huge backlog in repairs and overhaul of vehicles and equipments. In view of the above, as a responsible, recognised Federation of Defence Civilians, we felt it necessary to study the issue and bring forward certain salient aspects to your kind notice for remedial measures. There are eight Army Base Workshops, of which seven are responsible for repair and overhaul of equipment/ weapons and one workshop has been tasked with the responsibility of indigenisation and manufacture of spares. The Indian Army has a large inventory of weapon systems and equipment which need to be maintained and sustained in battle worthy condition. The periodicity of overhauling an equipment is based on the maintenance philosophy promulgated at the time of induction for the envisaged life cycle. As per doctrine published in 2014, the following is the intervention period for maintenance of Class “A” Vehicles. ^^ Only for OH-2 equipment and service up to or beyond 40 years. No overhaul policy for Scania, Kraz-255 B/B1 and Tatra T-815 is available and hence presently, Base workshops are accepting these vehicles of eight years vintage and above for overhaul as per the direction of EME Directorate. 124 numbers of Main Battle Tank (MBT) Arjun were inducted into the Army from 2004-05 onwards. The Tank is due for overhaul from 2020-21. However till date Overhaul agency has not been decided. A total of 310 T-90 Tanks were initially imported from Russia through a contract signed with the OEM i.e. M/s Rosoboronexport (ROE) in February 2001 and inducted into service during 2001-05. These Tanks are due for overhaul from 2018-19 but till date Overhaul agency has not been decided. Similarly, for Armoured Recovery Vehicles also, due to short sightness, overhaul plan and/or agency has not yet been decided. The ARV VT-72 B is a recovery vehicle for Tank T-72. A total of 156 ARVs were procured from M/s Bharat Heavy Electricals Ltd. (BHEL) and inducted into service during the period 1994-2003. As per maintenance philosophy and intervention norms, 129 vehicles inducted up to 2001 were due for overhaul during 2010-15. However, even after 20 years of the induction of the vehicle, no overhaul facility had been created. Similarly ARV WZT-3 is a recovery vehicle of latest technology available in Indian Army for Tank T-72. During the years 2001-07, 352 ARV WZT-3 were inducted into service through Bharat Earth Movers Limited (BEML). The equipment were due for overhaul from 2016-17 onwards. However, facility for overhaul has not yet been created. Project Tulip for establishment of additional facilities at 512 ABW as a nucleus for repairs/overhaul of communication and night vision devices for BMP II/ IIK is still pending since 2003. A whole lot of examples can be cited to substantiate the assertions that a section of Officials are deliberately trying to destabilise the Army Base Works. On the other hand, as per the Offsets Policy, a large number of potential Private Sector companies are planning to deploy their offsets obligation in the Maintenance, Overhaul and Repair business due to guaranteed business. This Federation has therefore viewed the inaction as stated above very seriously and demand that the Army Base Works be revitalised and all pending decisions such as creation of facilities for overhauling of MBT Arjun, T-90, ARVs etc be taken immediately. This will not only assure workmen of the seriousness of the government to protect the workshops, but is also in National Interest. An early action in the matter is solicited please. Revision of pension of Pre-2006 Pensioners/family pensioners who retired as NCC Whole Time Officers (Male) in rank of lieutenant, Captain, Major & Lt. Col – reg. All Managers, CPPC of Public Sector Banks. Subject: Revision of pension of Pre-2006 Pensioners/family pensioners who retired as NCC Whole Time Officers (Male) in rank of lieutenant, Captain, Major & Lt. Col – reg. Ref:- This office circular no. 102, dated 11.02.2013, C-144, dt. 14.08.2015 and C- 149, dt. 08.04.2016. Attention of all Pension Disbursing Authorities is invited to above cited circulars wherein instructions had been issued for implementation of GOI, Ministry of P,PG and pensions, Deptt of P&PW OM No.38/37/08-P&PW(A,) dated 28.01.2013 circulated under this office circular no. 102 dt 11.02.2013. According to these orders, revised pension and family pension of pre-2006 pensioners/family pensioners as revised w.e.f. 01-01-2006 in no case would be less than 50% & 30% respectively of the sum of minimum of pay in pay band and the grade pay corresponding to the pre- revised pay scale from which the pensioner had retired, as arrived at with reference to the fitment tables annexed to the Min of Fin, Deptt of Expenditure OM No. 1/1/2008 – IC dated 30-08-2008. In case of HAG and above scales, this will be 50% & 30% of the minimum of the pay in the revised pay scale arrived at with reference to the fitment tables annexed to the above referred OM dated 30-08-2008 of Ministry of Finance, Department of Expenditure. (2) For this purpose, a revised concordance table of the pre – 1996, pre-2006 and post 2006 pay scales/pay bands indicating the pension/family pension (at ordinary rates) payable under the above provisions was enclosed with ibid Govt. OM dt. 28.01.2013 to facilitate payment of revised pension/family pension. (4) In case the consolidated pension/family pension calculated as per Para 4.1 of OM No.38/37/08-P&PW (A) dated 01-09-2008 is higher than the pension/family pension tabulated above, the same ( higher consolidated pension/family pension ) will continue to be treated as basic pension/family pension. (5) All other conditions as given in OM No. 38/37/08-P&PW (A) dated 1.9.2008, as amended from time to time shall remain unchanged. (6) All pension disbursing authorities are therefore, requested to revise the pension/family pension in affected cases in terms of ibid circular. Payment made w.e.f. 01.01.2006 will be adjusted against the arrears now being paid and these cases may be reflected in the monthly account sent to this office as ‘change item’. (7) Where the PDAs are in doubt in regulating the payment of revised pension/family pension under these orders, the cases with full details of pensioner/family pensioners and PPO No: etc may be referred to Audit Section of this office for advice and further action.